In some ways they were right. 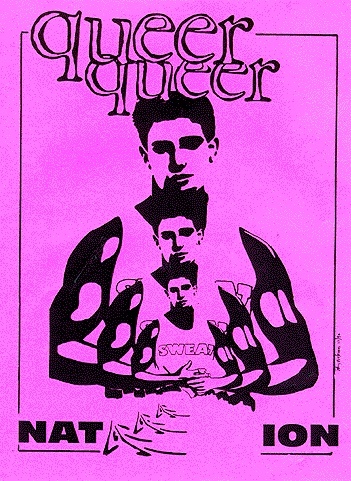 It took me about 2 weeks to find out about Queer Nation, a radical queer group of about 60 people that had its meetings at [[WOMEN'S BUILDING|The Women's Building]] in the Mission neighborhood of San Francisco. When I went to my first meeting in early September plans were already under way for a big protest to confront a rabid right wing preacher named Larry Lee and his Prayer Warriors. In some ways they were right. It took me about 2 weeks to find out about Queer Nation, a radical queer group of about 60 people that had its meetings at [[THE WOMEN'S BUILDING|The Women's Building]] in the Mission neighborhood of San Francisco. When I went to my first meeting in early September plans were already under way for a big protest to confront a rabid right wing preacher named Larry Lee and his Prayer Warriors.